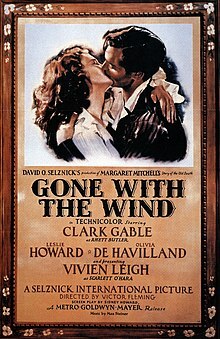 Gone with the Wind is a 1939 American epic historical romance film adaptit frae Margaret Mitchell's Pulitzer-winnin 1936 novel an producit bi David O. Selznick, o Selznick International Pictures. 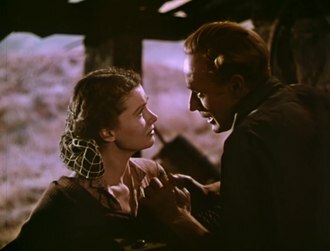 Set in the 19t-century American Sooth, the film tells the story o Scarlett O'Hara, played bi Vivien Leigh, an her romantic pursuit o Ashley Wilkes (Leslie Howard) who is mairit tae his cousin, Melanie Hamilton (Olivia de Havilland), an her marriage tae Rhett Butler (Clark Gable). Set against the backdrop o the American Ceevil War an Reconstruction era, the story is tauld frae the perspective o white Sootherners.